Over the coming few weeks before LAK13, we want to gauge the community’s thoughts and queries on these issues. LAK13 Conference Abstract: The Educational Data Scientist is currently a poorly understood, rarely sighted breed. Reports vary: some are known to be largely nocturnal, solitary creatures, while others have been reported to display highly social behaviour in broad daylight. What are their primary habits? How do they see the world? What ecological niches do they occupy now, and will predicted seismic shifts transform the landscape in their favour? What survival skills do they need when running into other breeds? Will their numbers grow, and how might they evolve? In this panel, the conference will hear and debate not only broad perspectives on the terrain, but will have been exposed to some real life specimens, and caught glimpses of the future ecosystem. We invite you to post your thoughts on the above, but also your questions too (plus any other observations and links to helpful resources). Add them as comments here, and we’ll draw on them in Leuven, when the panellists will share their responses (Wed 10 Apr, 1415-1515). And here we all were, with thanks to Taylor Martin for standing in late for Roy, who couldn’t make it unfortunately..
My name is Benjamin Roome and I am an educational data scientist. I wrote my doctoral dissertation on the theory of scientific measurement practices. In addition to being an entrepreneur I am a consultant to ed tech companies who need to understand the all important connections between learning analytics and business analytics. In order to succeed, ed tech companies need to make sure their users learn through strong engagement with the platform. This requires the generation and analysis of new types of data that bridge the gap between learning and measurable value to the customer. Educational data science often mixes two often different paradigms of investigation; on the one hand, real world classroom interventions with real students providing their opinions and subjective insight is important, while on the other hand large, repeatable, and highly controlled experimentation with statistical significance is important. As such it is useful to consider different perspectives when designing, implementing and evaluation educational data science experiments. My question is: Is the best approach for training educational data scientists one in which teams are formed of people with disciplinary perspectives (a multidisciplinary approach), or is it better to create new methods, instruments, and success measures that reflect a new disciplinary perspective (an interdisciplinary approach)? One reason the field of learning analytics is growing so quickly in higher education is because of the proven ability to change educational outcomes (eg. course signals). At the same time, we have established theoretical modes of learning (eg. social constructivism). Who’s responsibility is it to link/modify/adapt these theories to the analytics that support/refute/clarify them — does the educational data scientist play a role, and if so can you comment on what that look like? What is the difference between the Educational data scientist and the traditional Educational researcher? Is it just a matter of tools or methodologies or there is a deeper diference? The Educational Data Scientist is connecting node between or among different disciplinary domains, much like medical informaticists. As a result they need to know both the computational skills plus visualisation options, but also enough of the different disciplinary core concepts to advance their analysis as performed through these techniques. In this sense it may distinguish somewhat Xavier’s question in asking the difference tween the EDS & an educational researcher. If there is time – what is the one skill as supervisors of the coming generation of educational data scientists that we need to strengthen? John Behrens’ answer was not to get stuck as a technician, but become a scientist and question the assumptions everyone else takes for granted, or which are built (implicitly or explicitly) in the data’s structure. Bowker and Star (“Sorting Things Out” and later work) would argue that as the broader information infrastructure becomes taken for granted and hence invisible, this is also baking in assumptions (= classification schemes) that remain invisible. What does an educational data scientist prey on? There are two gaps I see in big social data generally, and learning analytics research specifically. First, there is a general awe around the volume of data available and perhaps as a consequence or possibly as an accident, a lot of papers I read lack a firm grounding in theory. How can we predict (an implicit goal) using data we analyze with lightweight or unclearly specified theories? 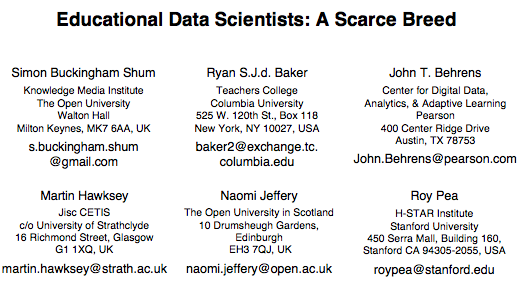 Second, with few exceptions people doing empirical data science work write up papers on single data sets. Doesn’t this limit potential contributions to more broadly useful theories? Third, the limitations of a business analytics frame become more clear, I think, through an examination of the first two questions. Is there not a real danger that administrators and managers expect “magic” from Learning Analytics, leading to an unfavorable fate for “Educational Data Scientists” generally, and Learning Analytics as a community, specifically? (Historical Example: The number of University ERP implementations that became financial disasters are too numerous to list – many (most) over promised and under delivered). Hi Sean – sorry we didn’t pick this up in the session. Point 2: yes, one of the huge potentials of moving education to a data-intensive science is new insights because we can see new connections between datasets that would not otherwise have come into dialogue. And on the hype curve, yep, we know how that will dip if we do not go in with eyes wide open to the limits of a ‘data fetish’ which excludes the human values woven into every step of the analytics lifecycle. Data does not speak for itself. This is where some of the most stimulating thinking is for me. Trackback: Learning Analytics: Theory-Free Zone? Trackback: ALASI2018: Educational Data Scientists: A (Less) Scarce Breed?